RevitaLift Anti-Wrinkle + Firming Eye Cream Review: Is it Safe? Aging is something that is unstoppable. It starts once you are born and ends when you’re dead. Nonetheless, there are many products that claim to stop the aging process. These are called anti-aging products which includes everything from dietary supplements to topical formulations. Currently, anti-aging skincare products are very popular with each one claiming to be the ultimate solution to signs of skin aging. The foremost problem is the fact that most products don’t really work and there is only a very small percentage that is actually effective. Let’s take a close look at one of the most popular products for addressing wrinkles and signs of skin aging around the eye area. What is L’Oreal Revitalift Eye Cream? The anti-aging product we will be inspecting is called Revitalift and it is from L’Oreal which is among the top skincare brands today. They are well-known for offering affordable yet highly effective products. L’Oreal has been around for a very long time and they have an established reputation for offering excellent products. L’Oreal Revitalift Eye Cream is a firming, anti-wrinkle cream that claims to offer smoother and firmer skin in 4 weeks. It is available in almost all retail stores including superstores and pharmacies. One of the best features of this anti-aging product is its low price ($17.99). 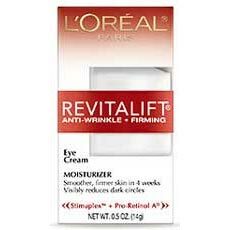 Who is the Manufacturer of L’Oreal Revitalift Eye Cream? The company behind the product is L’Oréal Paris. This is one of the leading manufacturers in the entire world. The company has billions of dollars in yearly turnaround and is probably the most famous brand in the industry. At the same time, it has thousands of different products which are scattered across different industries, providing an array of different benefits and advantages. The product is also making a few different claims. It is intended to enhance the skin and it is also giving time terms – it should do so in no more than 4 weeks. At the same time, it should also reduce the appearance of dark circles and reduce the formation of wrinkles and fine lines. The product is natural and it doesn’t seem to contain any serious side effects. L’Oreal Revitalift Eye Cream Ingredients – Are they Safe & Effective? What are the Advantages of L’Oreal Revitalift Eye Cream? What are the Disadvantages of L’Oreal Revitalift Eye Cream? The application process is very easy. Just apply cream in small dots around the eyes. Use a finger to gently smooth the cream until fully absorbed by the skin. This can be done once or twice a day. Apply L’Oreal Revitalift Eye Cream on clean skin after bathing or washing your face. Makeup or other skincare products can be used once the cream is fully-absorbed. The product retails for $17.99. The product is used carefully. It is a topical cream and you ought to make sure that you don’t get it in your eyes. This does seem like something that might actually be able to provide you with certain benefits. If you are looking for a reliable skincare cream for the area around your eyes, it might be something you could benefit from. It contains entirely natural ingredients without any chemicals in it, which is definitely something to look forward to. Of course, there are plenty of options on the market so you might want to take another look to see if you are making the best choice.